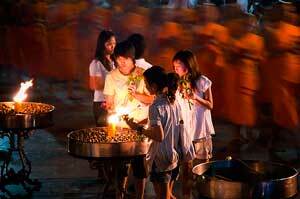 Makha Bucha day also known as Magha Puja day varies in Thailand based on the Lunar cycle. On this day 1250 monks gathered to hear Budda preach. Buddha ordained these monks and they in turn spread the Buddhist principles to the population. People that follow Buddhism will give alms to the monks in the morning and go to the temples in the evenings to listen to the sermons. At the sermons they will perform a ritual called the candle ceremony walking 3 times clockwise around the temple while holding flowers, incense and lighted candle.